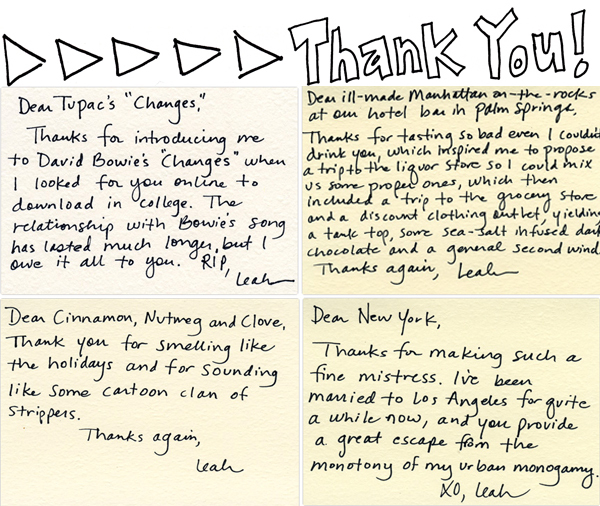 Thank you notes are my jam. I was taught very early on in life the importance of a thoughtful thank you note for anything and everything. When I was introduced to ThxThxThx, I immediately thought I had found my soul mate in Leah. She loves Tupac, she understood my exact feelings for Virgin America and thanks New York for well..... just being New York. Such good stuff! After being nagged by her mom to write thank you notes, Leah Dieterich starting writing one thank you note a day to all things big or small or odd. It could be a thank you to the three legged dog across the street to the songs she's embarrassed she likes. At first read, the thank yous are witty, cleaver and kindof everything you want to secretly say as well. Then as you read on, you find that the act of writing a thank you every day could turn into such a rewarding practice. Realizing the gratitude you have for all of life's little things reminds you that you truly do.... have it all! I decided to try my hand at a thank you for today! So can we all agree, there is a power in the art of someone's actual handwriting? As opposed to an email or a text..... someone's actual handwriting says a lot about that person. We should all do it more often. If you were to write a thank you note for today..... what/or whom would it be too?